Earnings growth of Indian companies is expected to pick up pace for the second straight quarter in the three months ended March, although it would still take a quarter or two before significant earnings upgrades come through, experts said. 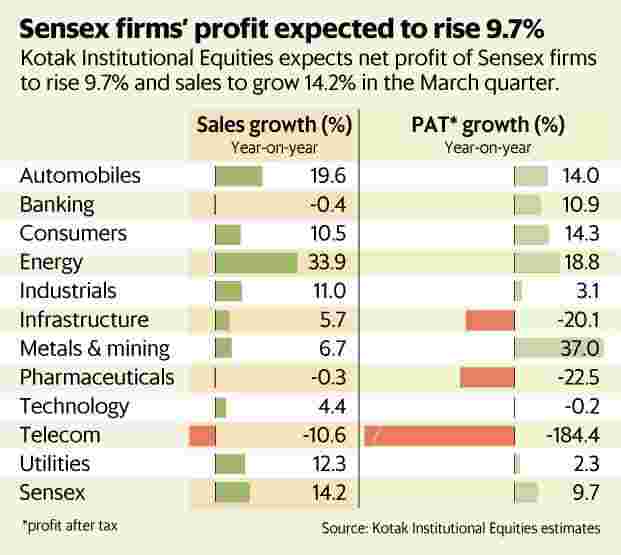 Profits of the 30 firms in the benchmark Sensex are expected to grow 9.7% from a year earlier in the March quarter, while sales are likely to rise 14.2%, according to estimates by brokerage Kotak Institutional Equities. “I think we are on course to see concrete recovery going ahead," Sanjeev Prasad, managing director and co-head of Kotak Institutional Equities, said over the phone from Singapore. “The economy is recovering, and earnings growth will recover faster going ahead." Analysts say that the growth is coming largely from select sectors such as commodities, automobiles and consumer products, while banks, which were the key drivers of the economy, are likely to post a dismal set of numbers on the back of rising bad loans. “The bank figures will continue to be weak for a couple of quarters due to high provisions, but they should see a pick-up after that," said Prasad. Edelweiss Securities expects the March quarter to broadly mirror the trend of earnings improvement in the preceding three months. It expects Nifty companies to post revenue and profit growth of 14% and 15% on a year-on-year basis, respectively, in the March quarter, implying 7% earnings per share (EPS) growth for fiscal year 2018. In the quarter ended December, Nifty firms’ sales and profit rose 11% and 9% respectively, according to data from Edelweiss. However, the composition worried some analysts. “While overall earnings are improving, the quality leaves much to be desired as commodities account for (greater than) 80% of the profit growth," Edelweiss analysts said in a 5 April note. “Core earnings (universe, ex-banks, commodities and telecom) are expected to inch up mere 6% on a low base (Q4FY17 profit had contracted 5%)." Corporate earnings showed signs of recovery in the December quarter as the negative effects of demonetization and the subsequent goods and services tax implementation wore off, but analysts had stopped short of calling it a full recovery. Earnings downgrades, however, are still expected to continue. “While earnings growth is improving, downgrades are likely for FY18 itself even if our numbers are met. Current estimates imply an asking rate of 25% plus for FY19, making earnings prone to downgrades," Edelweiss said in the note. This is the seventh consecutive year of EPS downgrades and sub-10% growth, Edelweiss said, adding that FY18, FY19 and FY20 Nifty EPS is expected to come in at Rs475, Rs600 and Rs705 respectively. Prasad of Kotak agreed. “I think downgrades will continue, mainly as we need to wait and see how banks’ provisioning for stressed assets pan out," he said. For auto companies, revenue growth is expected to be robust, primarily due to strong rural demand, higher realizations and a low base. According to Emkay Global Financial Services Ltd, most automotive manufacturers are likely to report double-digit revenue growth, and it expects revenue of companies that it covered to grow by 20% in the March quarter. Kotak expects banks under coverage to report decline in earnings led by increase in loan-loss provisions, lower contribution from treasury income and weak net interest income growth.